Nothing, absolutely nothing, can beat handheld comfort food when it’s made at home with love! 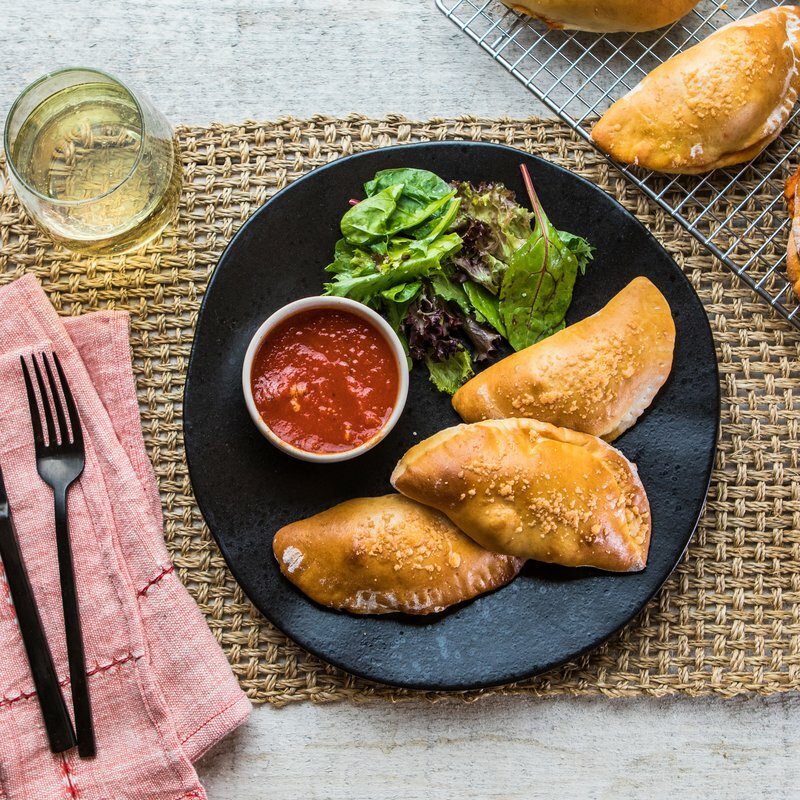 For these handmade mini calzones, dough is wrapped around a flavorful chicken parmesan-inspired filling of chicken cooked in a fragrant sun-dried tomato sauce, shredded and mixed with a generous amount of Cabot Alpine Cheddar Cheese. Then it’s baked to tender perfection for a finger-food that’s second to none. Note that, for the dough, you can use homemade dough or take advantage of frozen roll dough for a shortcut that won’t sacrifice the end result! Serve these upscale versions of the commercially available frozen convenience food with a salad and you’ve got a dinner that will soothe the body and soul. Feel free to share the recipe with friends and family on Facebook, Pinterest, Instagram, and Twitter! To make 6 servings (3 Chicken Parm Calzones per serving), add the chicken, marinara sauce, sundried tomato spread (or tomato paste), kosher salt and minced garlic to an Instant Pot or slow-cooker. If using the Instant Pot, cook on high pressure for 30 minutes, then release the pressure quickly. If using a slow-cooker, cook on HIGH for 3 hours, or until chicken falls apart easily with a fork. 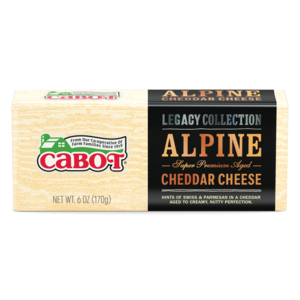 Using 3 forks, shred the chicken in the cooking sauces and then stir in the Cabot Alpine Cheddar Cheese and ¼ cup of the grated parmesan until the cheese is fully melted and incorporated. Transfer to a bowl, cover with plastic wrap and cool in the refrigerator. Preheat your oven to 350°F and line two half sheet pans with parchment paper. Roll out one piece of dough at a time on a well-floured surface into an approximately 5-inch circle. Scoop about 3 tablespoons to ¼ cup of the cooled chicken filling to the right of the center of the round of dough. Fold the left side over the filling and crimp the dough shut, being careful that no chicken sticks out. Arrange mini chicken calzones on the prepared sheet pan, leaving at least 3-inches between them to allow for expansion as they bake. Repeat with the remaining dough pieces and chicken filling. Brush the dough pockets with the beaten egg and bake for 16 minutes, removing the pan from the oven and sprinkling with the remaining grated parmesan cheese. Bake an additional 10-14 minutes, or until the pockets are a deep brown. Serve with remaining ½ cup of marinara and enjoy! Note: Sometimes you may have a particularly ‘juicy’ filling that causes the bottoms of your mini calzones to be a little wet after baking. To fix this issue, line another half sheet pan with fresh parchment paper, transfer the chicken calzone pockets onto the clean parchment upside down and return to the oven for 4 minutes. Transfer right side up to a cooling rack to cool for 5 minutes before serving. Love making your favorite handheld foods at home? Then you’ll have to give our homemade Pizza Bites a go next! As a co-operative of over 800 farm families, our goal is to make the highest quality and best tasting dairy products you’ll find. We’d love for you to rate and review the recipe for these Mini Chicken Parm Calzones once you’ve made them! 18 frozen roll dough rounds thawed according to package instructions, or 1½ pounds of bread dough, divided into 18 equally sized pieces. ADD chicken, marinara sauce, sundried tomato spread or tomato paste, kosher salt, and garlic to an instant pot or slow-cooker. If using the Instant Pot, cook on high pressure for 30 minutes, then release the pressure quickly, or cook in a slow-cooker on HIGH for 3 hours, or until chicken falls apart easily with a fork. USE 2 forks to shred the chicken in the cooking sauces. Stir in the Alpine Cheddar and ¼ cup of the grated parmesan until the cheese is fully melted and incorporated. Transfer to a bowl, cover with plastic wrap, and cool in the refrigerator. ROLL out one piece of dough at a time on a well-floured surface into an approximately 5-inch circle. Scoop about 3 tablespoons to ¼ cup of the cooled chicken filling to the right of the center of the round. Fold the left side over the filling and crimp the dough shut. Take care not to let the chicken stick out. Arrange on the prepared sheet pan, leaving at least 3-inches between them to allow for expansion as they bake. Repeat with the remaining dough pieces and chicken filling. BRUSH the dough pockets with the beaten egg. Bake for 16 minutes, removing the pan from the oven and sprinkling with the remaining grated parmesan cheese. Bake an additional 10-14 minutes, or until the pockets are a deep brown. Note: You may find that sometimes you have particularly ‘juicy’ filling and the bottoms of the hot pockets are a little wet after baking. To fix this issue, line another half sheet pan with fresh parchment, transfer the hot pockets onto the clean parchment upside down, and return to the oven for 4 minutes. Transfer right side up to a rack to cool for 5 minutes before serving. Serve with remaining ½ cup of marinara. Amazing food. You got to try it out! !